TAMPA (November 1,2018) -- With its arrival on the runway at Tampa International Airport Wednesday night, Norwegian Airlines became the latest international carrier to touch down in Tampa Bay. The low-cost carrier announced in June that it will begin flying nonstop twice a week between London Gatwick (LGW) and Tampa International Airport (TPA) on October 31. With its arrival, Norwegian joined legacy carrier British Airways to become the second international airline flying between London and Tampa Bay. British Airways flies from London daily. The Norwegian flights will depart from Tampa on Wednesdays at 10:50 p.m. to arrive in London at 10:45 a.m. Thursday, and on Saturdays the flights depart at 10 p.m. to arrive in London at 9:55 a.m. Sunday. 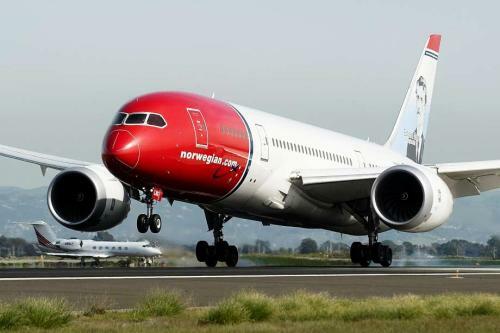 From London, the flights depart Wednesdays at 2:55 p.m. to arrive in Tampa at 8:35 p.m. and on Saturdays at 2:05 p.m. to arrive in Tampa at 7:45 p.m.
"We are very excited to have Norwegian Air join the growing list of international routes to Tampa Bay," said Santiago C. Corrada, President & CEO of Visit Tampa Bay. "The UK is Tampa Bay’s largest source of overseas visitors. The addition of Norwegian means more visitors from the UK and Europe will get to discover the treasures that await here in the hip, urban heart of Florida&apos;s Gulf coast. " Norwegian’s service between Tampa and London will be on a 787-9 Dreamliner with 309 Economy seats and 35 Premium Economy seats. This is the first Dreamliner with regularly scheduled service at TPA. The aircraft is known for a quiet and more comfortable ride for passengers, as well as better fuel efficiency. Introductory fares will start at $214.90 one-way in Economy and $604.90 one-way in Premium Economy. Premium includes a dedicated check-in counter, fast track security, lounge access at selected airports, large and wide recliner seats with ample legroom, all meals and drinks and other benefits. With the addition of Norwegian Air, TPA now has seven international carriers and flying from more than a dozen cities around the world. The airport has seen a more than 120 percent increase in international passenger growth since 2011. To book a flight on Norwegian Air, visit https://www.norwegian.com/us/.